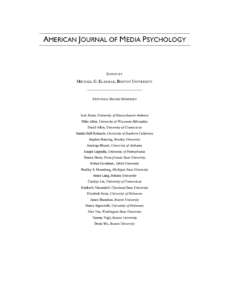 Beginning In 2007, I was appointed as Founding Editor of the American Journal of Media Psychology (AJMP). 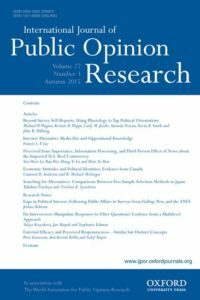 In 2011, I was offered the position of editor of the International Journal of Public Opinion Research (IJPOR). AJMP is a peer-reviewed scientific journal that published theoretical and empirical papers that advanced an understanding of media effects and processes on individuals in society. AJMP was published by Marquette Books. I continued to serve as editor of AJMP up until 2012. IJPOR is a peer-reviewed scientific journal that publishes theory-driven multi-disciplinary research in the area of public opinion measurement and analysis. It is the official journal of the World Association for Public Opinion Research (WAPOR) and is published by Oxford University Press.